As you sit at home with all of your big expensive appliances, it’s hard to contemplate that there are still plenty of people who still dry their clothes the old fashion way, by hanging their wet laundry on a clothesline. The Spincaz is a USB drive which reminds us of the simple ways of doing things we take for granted. 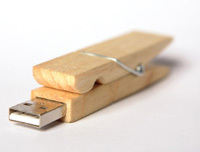 The Spincaz acts as any other wooden clip would. You can attach it to your clothes for a humorous garment accessory, or even hang it out to dry in the air with your clothes. 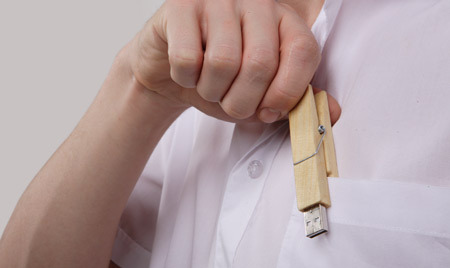 Though hanging an electronic on a wet rag is probably not the best idea if you feel like using your USB drive again at some point. If you’re more of the nerdy type, you can hang the drive in your front breast pocket, right next to your calculator and pocket protector. You’re sure to get some interesting gazes from people who are wondering why you would ever need a wooden clip in your pocket at all times. We’ve come a long way as a society, but we still have a ways to go before everyone has the same amenities that we have become so comfortable with. Owning something like the Spincaz is a handy reminder of the times where a clothesline was the only way to dry your clothes unless you wanted to pop it into the microwave and risk some serious shrinkage.